This is the final list with all 76 capacitors that can be found on the main PCB. Please pay attention to the footnotes. Initially I had planned to solder the new SMD capacitors using solder paste and hot air, but then I found it much easier to use regular soldering equipment, following this method. Next, I took on the big electrolytic and film capacitors. As most of the replacement capacitors were taller, I had to put them in horizontal position. Especially C939 must not be taller than 7 mm, as it sits right underneath a screw of the hinge assembly. In the following picture, you can see the damage that the screw will cause when the top cover is just lying on it for a week. After all capacitors have been replaced, it’s time for a first test. 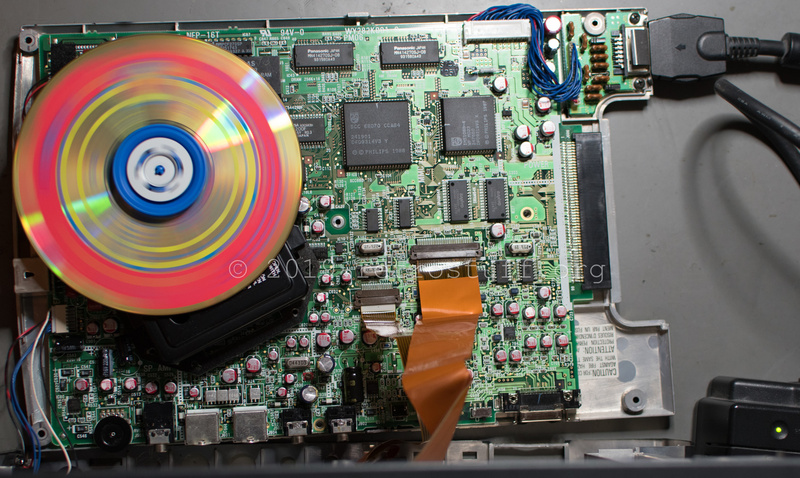 A magnetic weight from an old PC CD-ROM drive keeps the disc in place. As you can see, it is spinning again. 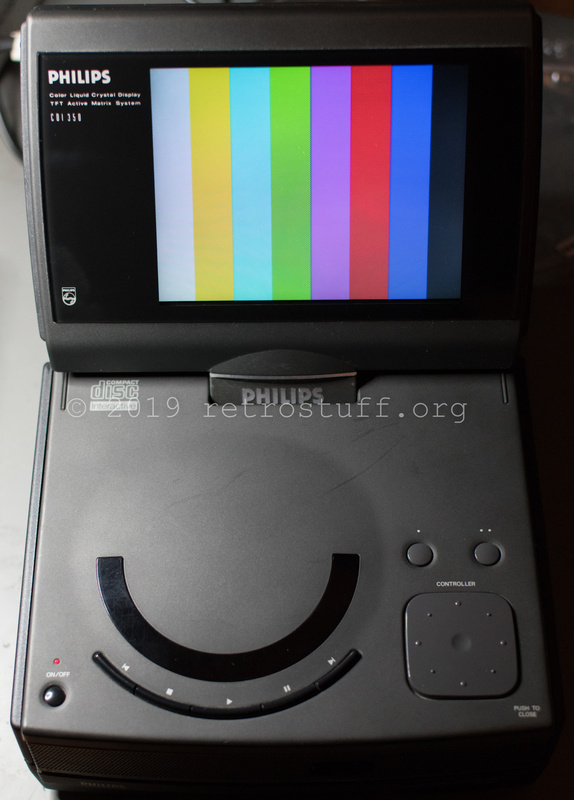 The new capacitors fixed all problems that I encountered before: flickering screen, discs not being read and also the input port for low level tests with a VT100 terminal. All the tests were completed successfully. Now it’s time to put everything back together. I’ve already soldered the metal shield back to the input/output ports. 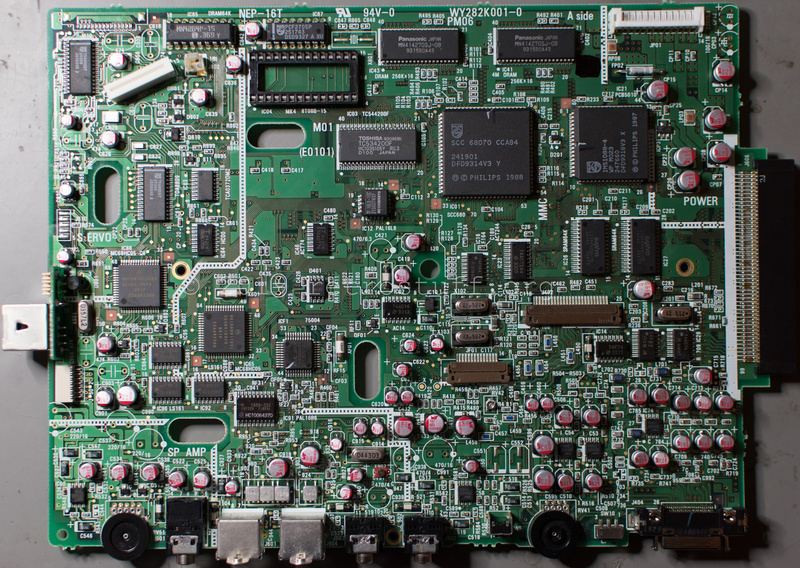 The bevel edges of the small plastic piece of the PAL/NTSC switch have to face the PCB. 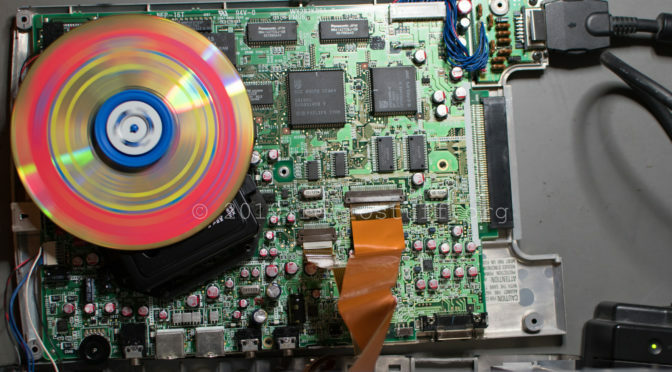 Do not forget the screw underneath the CDM, as I did the first time. 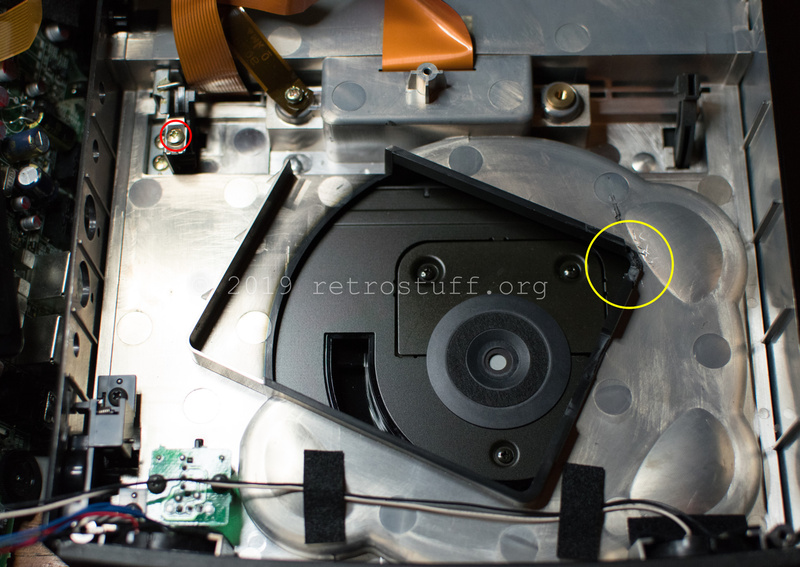 Also note capacitor C939, it is now in horizontal position, so it doesn’t collide with the hinge assembly anymore. A small part of the CDM frame in the top cover needs to be cut, as the new socketed clock chip is slightly taller (yellow circle). 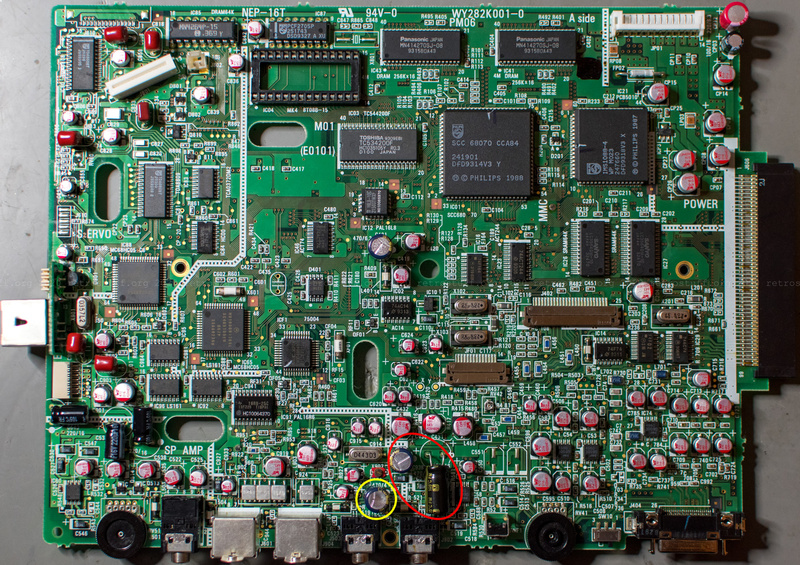 On this picture, you can also see the screw of the hinge assembly that can collide with capacitor C939 (red circle). After everything has been put together, I also tried the service shell. This player does not need a dummy plug, instead you have to hold the ‘DISPLAY ON/OFF’ and action button 2 while switching on the power. Again, all tests were successful. The next picture shows the video test image. Even though everything seems fine, I’m still not entirely happy with the player at the moment. I figured out that the S-Video port is not outputting any signal. 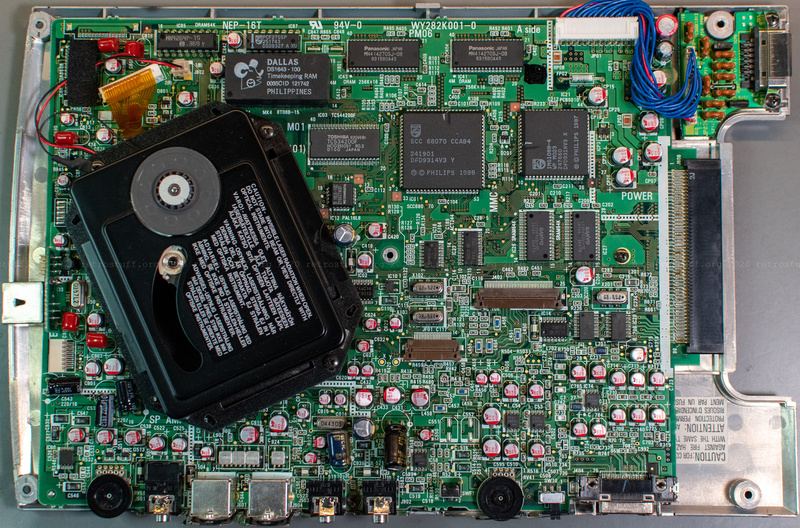 There are some more capacitors in the extension module, the screen and the power supply. I’ll have to watch the internal clock to see if a calibration is needed (step 11 of the low level MMC test). The proprietary RGB in/out port needs further inspection to build a proper cable. 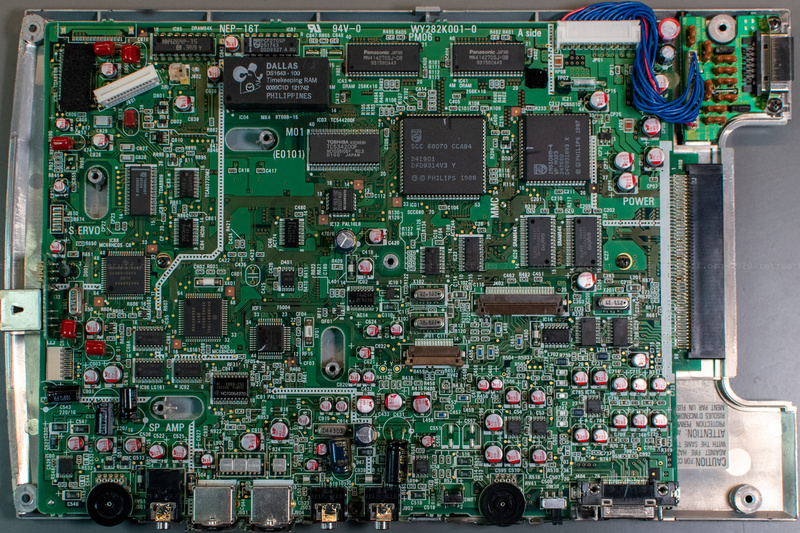 There seem to be plenty of topics for a part 3 of the CDI350 repair article.